Mangos are the fruit of the mango tree—and it brings images of a tropical island because it is a tropical fruit. Mangos are actually the world’s most popular fruit! Mangos are full of vitamins—particularly Vitamins A and C—where one mango provides about 1/3 of the RDA for Vitamin A and nearly 100% of the RDA for Vitamin C.
Mangos also contain significant amounts of Vitamins E, K and B complex vitamins (except for Vitamin B12). Mangos are also high in fiber and contain calcium, potassium and copper. They also contain some omega-3 and omega-6 fatty acids, though overall, are very low in fat. One ripe mango can contain 31 grams of sugar, but its glycemic load is only 10—the fiber in mango helps limit the rapid absorption of the sugars. One mango also has 135 calories—not so bad! Mangos are higher in sugars than many other fruits, but that doesn’t mean you shouldn’t eat mangoes. The Mayo clinic recommends that one serving of fruit should contain 15 grams of carbohydrate—that translates to about ½ cup of mango. If a fruit has lower carbohydrate or sugars, that generally means you can enjoy more of it—but it doesn’t mean you can’t enjoy the higher carbohydrate fruits! Just remember to keep track of the total carbohydrates in a day. In fact, studies indicate that eating mangoes can help prevent diabetes complications and may even treat prediabetes and prevent diabetes. 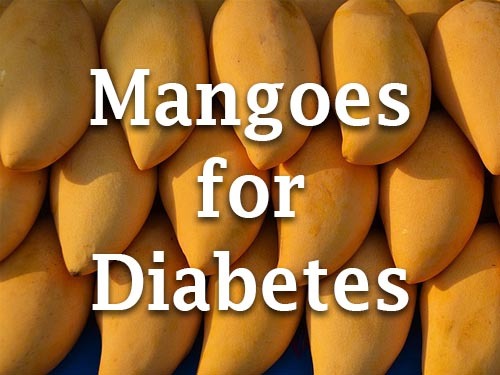 Why Would Mangos Be Good For Diabetes? Most nutritional sites contain information like that given above—the level of carbohydrates, proteins, fats, vitamins and minerals. That is great, but they very often don’t include information on all the other nutrients in food—the antioxidants, the plant sterols and other phytonutrients. One of the non-listed components of mangoes is a substance known as mangiferin—which, in addition to anti-inflammatory and anti-viral activities, also can help lower blood sugar levels. This substance also has been shown to stabilize and support blood vessels. Other research indicated that other components in mangoes including quercetin and a derivative of mangiferin can modulate the same cellular constituents that are the targets of the anti-diabetes drugs, the thiazolidinediones also known as the glitazones which include rosiglitazone and pioglitazone. These targets for the glitazones are the peroxisome proliferator-activated receptors or the PPARs. There are a number of PPARs that are involved in blood sugar regulation as well as in cholesterol regulation. More recent research has indicated that mangiferin may also affect certain enzymes that can positively influence the metabolism of blood sugars and to protect against fatty deposits in the liver. While most of the research on the benefits of mango have been done either in the lab setting, in cell cultures or in animal studies, one recent study shown that eating freeze-dried mango reduced blood sugar levels in both men and women. 20 obese adults ranging in age from 20-50 years old were given the freeze-dried mango for 3 months. While they did not lose weight, the men did experience a decrease in hip circumference—no such luck for the women. Mango was also recently tested in 10 people with T2D. The glycemic response to a number of fruits was tested—the fruits included bananas, oranges, pineapples, pawpaw and mango. The portions were standardized so that everyone had 50 grams of carbohydrate per serving. Mango showed the least rise in post-meal blood sugar levels—second and third least were oranges and pawpaws. Don’t forget that mangoes are a great source of Vitamin C and Vitamin A. Vitamin C is an important anti-oxidant that can recycle itself and be used over and over again to reduce the levels of damaging free radicals—believed by many to be at least one of the sources of the complications of diabetes—the neuropathy, the retinopathy, the damage to blood vessels and the damage to the kidneys. Humans are one of the few mammals on the earth that cannot make their own Vitamin C—we have to get our vitamin C from foods. One study showed that 1000mg of Vitamin C a day can help decrease blood sugar levels as well as fat level in the blood. Other studies have shown that same amount—1000 mg taken in 500mg tablets twice a day—can lower the overall inflammatory status in diabetic patients with or without high blood pressure. While it is not known what specific effect vitamin A may have on diabetes patients, we do know that vitamin A is important for normal sight, a normal immune system and thyroid health. We also know that vitamin A has a number of important gene regulation functions. By now you probably know there is hardly ever the last word in diabetes. However, it can be said with confidence that mangoes are a healthy fruit and have been directly shown to have benefit on controlling blood sugar and may very well work via the same types of cell receptors that the glitazones do. We also can be certain that as long as you continue to keep track of your total daily carbohydrate, having some mango is absolutely a good idea. The future may bring more information, but for now, close your eyes, imagine yourself on that tropical island and have a bit of juicy and delicious mango! Muruganandan, S.; Srinivasan, K.; Gupta, S.; Gupta, P. K.; Lal, J. Effect of mangiferin on hyperglycemia and atherogenicity in streptozotocin diabetic rats. J. Ethnopharmacol. 2005, 97 (3), 497–501. Daud, Noor Huda, et al. “Mango extracts and the mango component mangiferin promote endothelial cell migration.” Journal of agricultural and food chemistry 58.8 (2010): 5181-5186. Excellent article for diabetics. But what quantity is safe for diabetic person??? just wanted to know the insulin index of mango! Excellent articles for diabetes.just want to know what quantity is safe for type 2 diabetes. It’s a good article, no doubt, but differences between sweet and sour mangoes are not shown. Ripe and green mango I think is not the same as to the sugar content the sour taste will turn sweet when it becomes ripe eating the green mango the human body will not be able to change the sourness to sweet which only the plant can do. This needs further study. Really appreciate your words of wisdom. Better than seeing my doctor. It is new knowledge to help me be aware and less stressed on my food intake. Makes a difference in my health to feel more confident in controlling my eating habits with type 2 diabe…..